Are you experiencing a chill in the air in your neck of the woods? 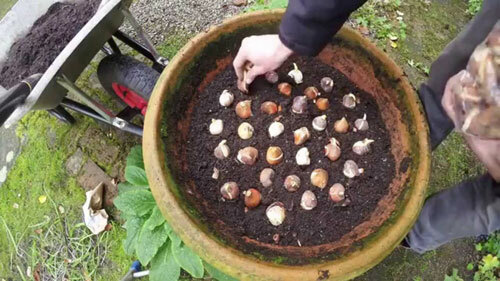 Crisp October weather provides ideal planting conditions for hardy bulbs, including daffodil, tulip, hyacinth, crocus, grape hyacinth, snowdrop, and more.... 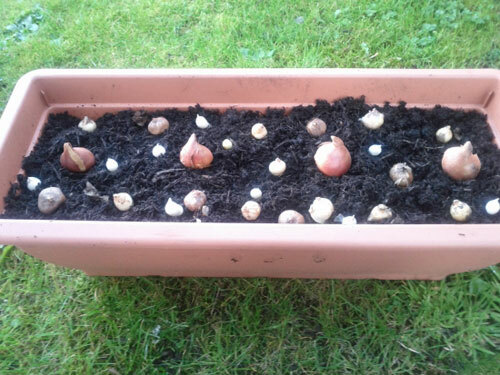 Planted this month, these kinds of bulbs that can easily be potted and planted now, will bloom perfectly next spring. Now is the time to give them a chance to root into the cool dark soil before the weather turns to freezing. 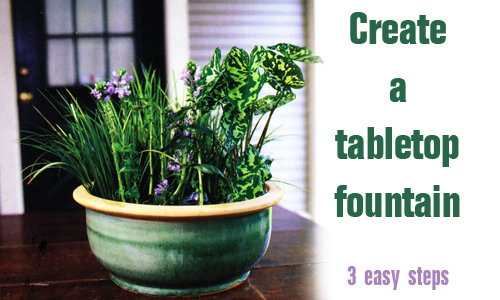 Here are a few tips on how to achieve this potting wonder from Arizona Pottery? Pick the best spot to place the Arizona Pottery garden planters you want to plant them into. Make sure that come spring and summer they will have as much sun as possible At least 6 hrs of full sun is best. Next fill the pot with good well draining soil. You can purchase special garden soils available at your local nursery for this purpose. Loose soil is ideal for the root systems to work into. Make the soil organic if possible for the best performance. You can mix compost into the soil to really help with healthy root systems. Cluster the bulbs into the Arizona Pottery garden pots mixing one bold color or mixing a combination of colors to create the effect that you are trying to achieve. We love pink & white mixed together. Yellow and red mixed make a very bold statement of color that is stunning. Place the root side down with the growing tip up and cover with soil. Place it two to three times its height into the hole. Compact the soil to eliminate air pockets and cover the top soil with garden mulch up to 3" in depth. 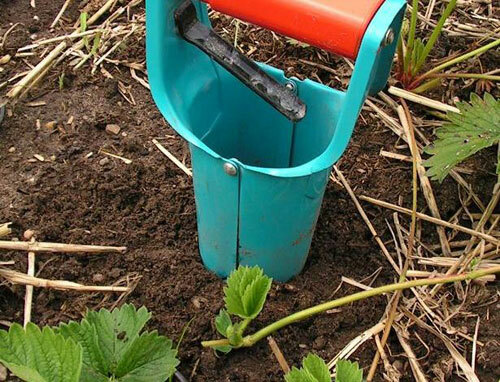 Use a garden trowel to make the planting easier. Power drills work good for larger pots but are not necessary. 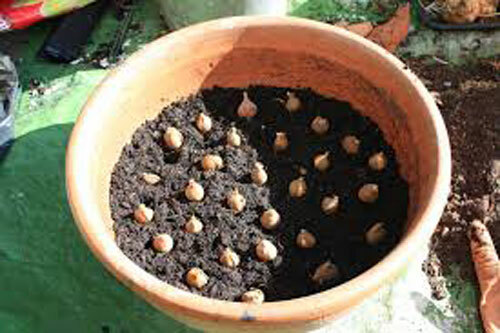 We like to stick bulbs around potted evergreen plants so that come Spring there will be bursts of color. 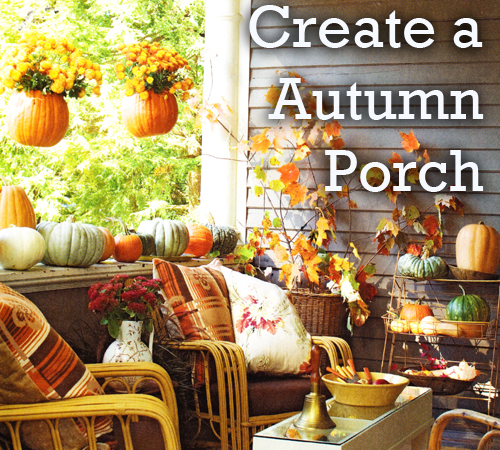 Now is the time to transform the porch on the front of your home and create a wonderful and cozy place to enjoy this time of year as the weather cools off. All summer long you used the porch as an oasis from the heat. Because fall has arrived and you move inside, don't neglect this important area that you can still use. 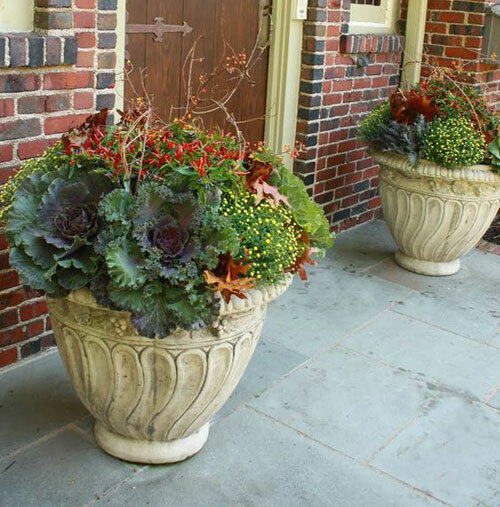 An easy way to transform any area, whether it's a porch or patio, is by adding garden planters. 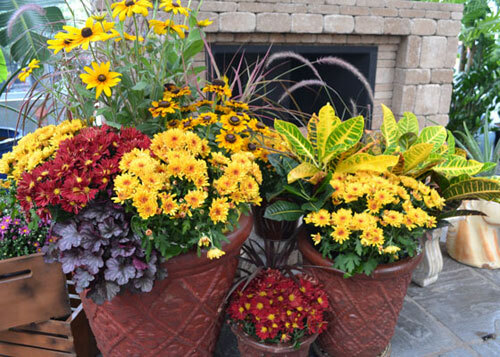 They can be colorful to compliment the fall leaves or traditional terracotta containers with it's warm sun baked color tones. Make sure the planters are large enough to handle the type of plant materials we will suggest. Plant items like green & purple cabbage. These grow large and have bright colorful leaves that spread out. Plant marigolds and chrysanthemums. They both have bright bold orange and yellow colors. Take empty garden containers and fill them with straw. Top the straw with gourds and squash in colorful shades. 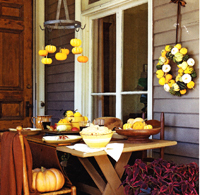 Fill a planter with fall leaves and top with pumpkins that have been carved and filled with twinkle lights. Remember that the items will be protected on a covered porch so they will look lovely for a longer period of time. Most of the plants recommended are meant to stand up to this type of weather and have good results. Other fun ideas: Pillows in fall colors and great textures always add warmth and comfort. 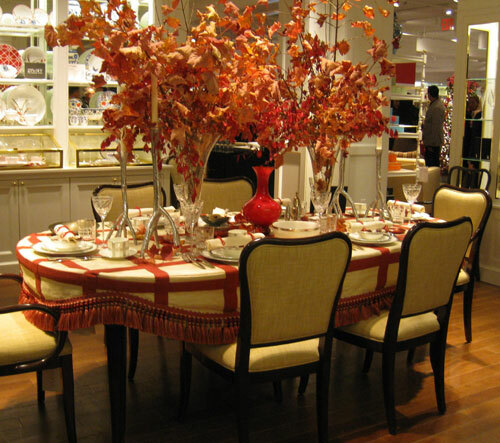 Try covering your seat cushions on the chairs with a fall fabric in leaf patterns or wheat colors. Use re-purposed items in varying heights and eye levels. Wire plant stands, shallow trays, small side tables filled with apples & plums. 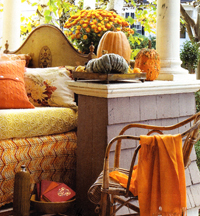 Line porch railings with small potted planters of mums, use pumpkins everywhere to add color. All of these ideas using pots are easy to do and not expensive. Try to use things you find laying around your garden or yard, this makes it fun and creative. Read more.....Placing stones in the garden area. Read more.....How to help your garden survive winter. 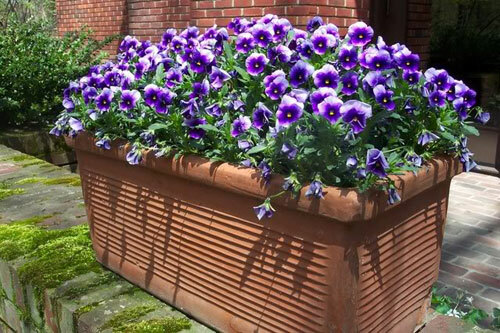 This fall we recommend you fill your garden planters with lovely pansies and violas. They will make your planters glow!!!! The easiest way to add long lasting color to the fall garden, and the answer is simple: potted pansies & violas. They bloom prolifically and ask for a few things. They love sun (atleast 6 hours a day) and fertile well draining soil. It is also important to feed the flowers with an organic fertilizer such as blood meal alternating with a liquid plant food. Select any size container that suits your needs since they will grow in small and very large bunches. You can also mix in herbs such as parsley, lemon thyme, golden sage, and rosemary, as well as with veggies such as kales, chards, and mustards. 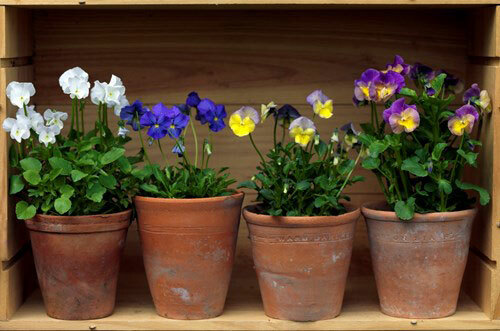 Pansies and violas are always happy plants - both are ideal for new and experienced gardeners. Here is another way to try this seasons newest blooms. Cool wave pansies that are spreading plants that love cold weather. The first thing you want to do in plant in a nice garden planter so that the roots don't spread and take over your garden. They will grow 6 inches tall but will spread if you don't contain them. This cool wave pansies works great in a hanging basket or wall pot where you will love their cascading over the sides of the planter. 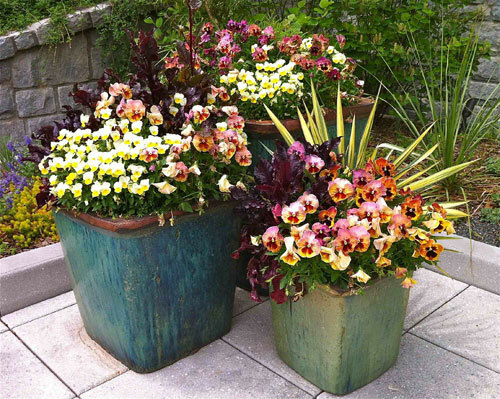 Read more.....5 tips for overwintering containers. 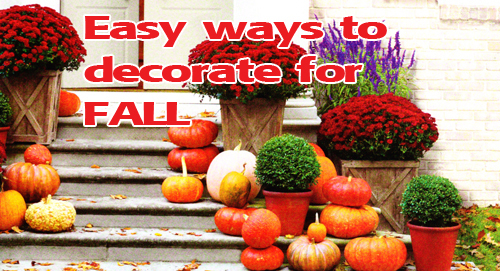 Finding ways to decorate this time of year is easy and inexpensive. Just select a clay garden pot, metal garden urn, or concrete garden planter, fill with edible plants, herbs, leaves, branches, gourds and pumpkins. It's so fun to do and we have a few cute ideas. Vertical displays are making a big splash on patio walls and porch decorations. 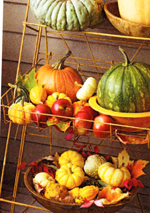 We love the idea of stacking pumpkins between layers of branches & leaves. 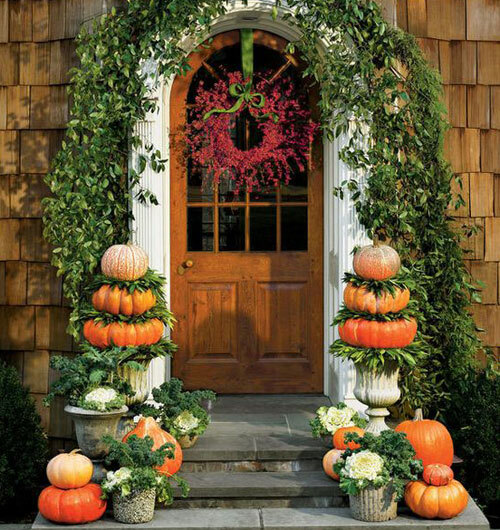 To create topiaries, sandwich bay wreaths between pumpkins stacked in a sandstone urn, and top with a small pumpkin. You can carve the pumpkins with different designs, you can then add candles or electric lights to help illuminate them. 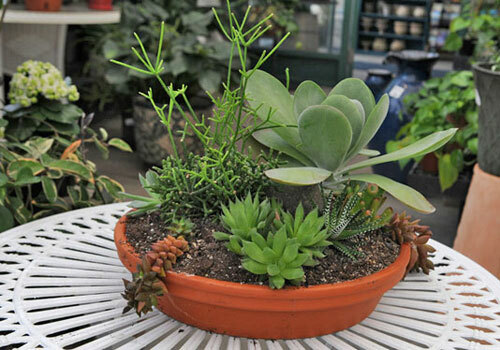 Take a low garden tray or plant saucer, and fill with pre-moistened soil mix and fill with succulents. Add them closely to each other so there isn't a lot of space between each plant. Fill crevices with moss which thrives in well drained soil in sun or part shade as do the succulents. Top with pumpkins for weight and interest. Water when the soil dries out and leave outside until it freezes. This looks lovely on a garden table. Take garden planters and fill with the ever popular Mums. Each fall all nursery and garden centers are full of them. Use deep dark bright colors in red, orange and yellow. Fill in around the containers with gourds, pumpkins and evergreen plants. At seasons end transplant them to the yard or other smaller planter pots. Enjoy for several more seasons until they outgrow their containers and then re-pot. Above a trough shows off the bright white stems of bok choy. This is a perfect shape of garden pot for this type of plant. 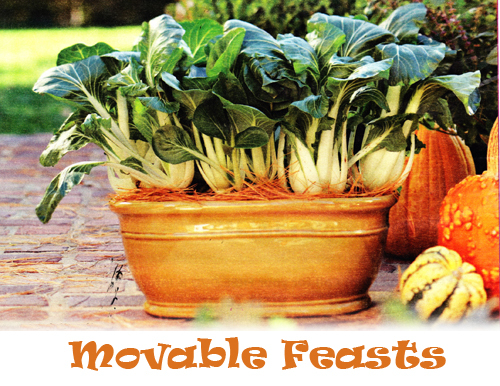 Bok Choy is great in salads and stir fry dishes. You don't need a large planter to get this job done. Plants in this container will stay fresh through early frosts. Mustard and kale fill out the pot with soft greens and purples. The orange pansies highlight the container color. 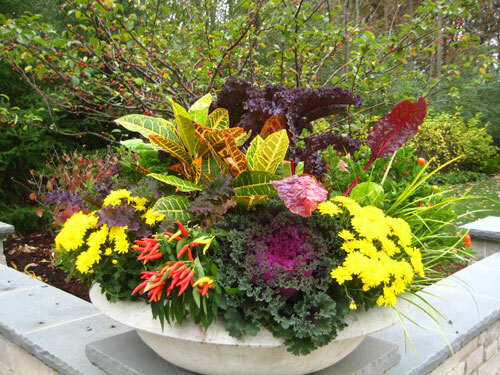 The textures of fall edibles are great in garden planters and you can use the flower colors as accents. 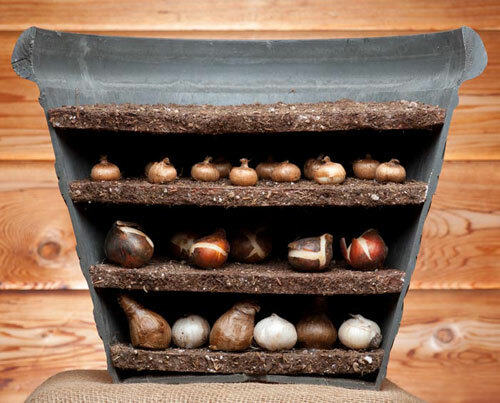 Terracotta pots are great for the root systems of all garden plants & veggies. The clay breathes and the roots love it. The orange color looks lovely in this type of pottery. A group of simply salad greens slips easily into a clay terracotta pot. The alfresco mix includes leafy lettuces and arugula, endive, and radicchio. Snip a few leaves from each, give a quick rinse, and a salad is ready. How easy is that! Leave on a patio table or place on a kitchen counter with sun exposure. Use this bowl to decorate indoors and outdoors the greens are stunning and tasty. 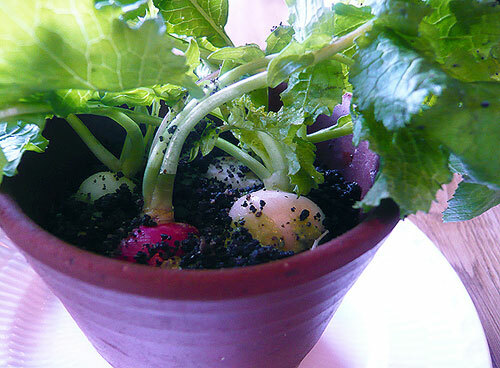 Here are a few general tips to consider when potting vegetables. Buy transplants - the larger the better - rather than starting from seeds. You will be able to snip for salads as soon as you take them home. Use edible flowers as cheerful accents. 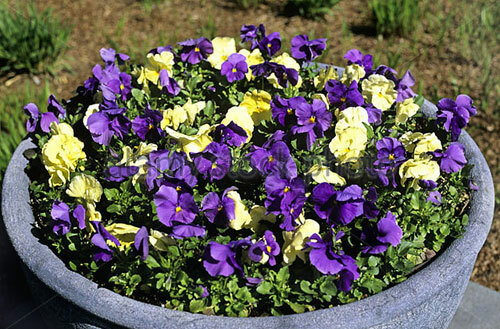 Pansies and violas add punch to containers and they are pretty tossed into salads. 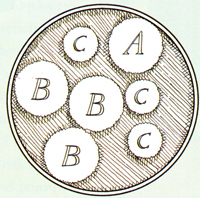 Pack plants close together. Autumn is short and you will be harvesting leaves, so the plants shouldn't outgrow their pots. Lastly, include herbs in the pots. As fall winds down, transplant them to a bright interior windowsill.